Virgin V Festival official and Exclusive ticket + coach travel partner. Tickets and Coach travel, bus travel to V Festival. Hylands Park and Weston Park coach travel and V Festival tickets. Big Green Coach is once again the OFFICIAL and EXCLUSIVE Virgin V Festival 2017 ticket + coach travel partner. Big Green Coach now offer day return coach services for all customers wanting to experience V Festival Stafford for the day on either SATURDAY or SUNDAY. All coaches are scheduled to arrive for the first acts of the day and return for home only after the main headliner has finished. Choose to buy trave with or without your day entry ticket. 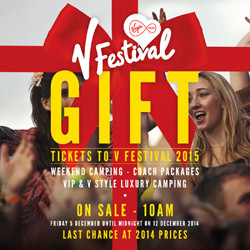 Virgin V Festival ticket + coach packages on sale NOW! Choose day or weekend camping tickets. Coach travel only also on sale now. Book your Official Virgin V Festival tickets here and you can secure your travel straight to the festival official coach park. More people chose to travel with Big Green Coach to Virgin V Festival than ever before last year - don't miss out! We drop you right by the entrance and take all the hassle out of your travel! Return coach travel is available to both Virgin V Festival sites - Hylands Park, Chelmsford and Weston Park, Staffordshire from Big Green Coach. Please note: ALL tickets for Hylands Park, Chelsmford are for RED CAMPSITE (Yellow campsite now sold out). All coaches arrive at the official Virgin V Festival coach station on Friday 18th and depart for home on Monday 21st August 2017. With 80 departure points to Virgin V Festival from all over the UK, there should be a pick up point close to you! Bishops Stortford, Bournemouth, Brighton, Bristol, Cambridge, Canterbury, Chichester, Colchester, Crawley, Dartford (Bluewater), Dover, Gillingham, Guildford, Hemel Hempstead, Ipswich, London (Croydon), London (Victoria Coach Station), Luton, Milton Keynes, Northampton, Norwich, Oxford, Peterborough, Poole, Portsmouth, Reading, Southampton, Swindon and Worthing. Abergele, Barnsley, Birkenhead, Birmingham, Blackpool, Bradford, Bridgend, Bristol, Cardiff, Carlisle, Cheltenham, Chester, Chesterfield, Colwyn Bay, Conwy, Coventry, Darlington, Derby, Doncaster, Durham, Exeter, Flint, Glasgow, Huddersfield, Hull, Leeds, Leicester, Liverpool, Llandudno, London (Victoria), Manchester, Middlesbrough, Milton Keynes, Newcastle-Upon-Tyne, Newport, Nottingham, Plymouth, Prestatyn, Preston, Rhyl, Rotherham, Scunthorpe, Sheffield, Shrewsbury, Stockport, Stockton, Stoke-on-Trent, Sunderland, Swansea, Taunton, Warrington, Wigan, Worcester, Wrexham and York. Choose your departure location from: Birkenhead, Birmingham, Coventry, Derby, Leicester, Liverpool, Manchester & Nottingham. Virgin V Festival ticket + coach packages, exclusively to Big Green Coach.